Tamil Nadu is the best performing state in organ donation. For the fourth time in a row, the southern state — on the occasion of ‘9th Indian Organ Donation Day’ on Tuesday — was honoured for its successful organ donation programme. The event was organised by the National Organ and Tissue Transplant Organization (NOTTO) is an entity set up under Directorate General of Health Services, Ministry of Health and Family Welfare. It functions as an apex centre for coordination and networking for procurement and distribution of organs and tissues, and registry of organs and tissues donation and transplantation in the country. According to a TOI report, Tamil Nadu has been able to retrieve organs from more than 1,000 patients. Dr. C Vijaya Baskar, Minister of Health, Government of Tamil Nadu, who received the award, expressed his happiness for his state being adjudged the best state in organ donation for the fourth time in a row. He highlighted the exemplary work that Tamil Nadu had done in retrieving organs from donors; and had been the first state in India for various initiatives like mandatory certification of brain stem death, streamlining organ distribution and setting up green corridors. Maharashtra was awarded for being the best state for promoting awareness on organ donations. Dr. Subramania Iyer K, AIMS, Kochi was felicitated for conducting first hand transplant in the country and Dr. Shailesh Puntambekar, Pune, received the award for conducting first uterine transplant in India. Choubey further said that many myths and misconceptions surround organ donation. He stated that very often, organ donation gets discouraged on the basis of superstitions. The minister urged the people to come forward for organ donation without any fear. She further said that it is important to understand that in India it is mainly the living donors who are donating organs and only about 23 per cent of the organ transplant is being done with organs obtained from the cadavers. “There is a need to promote cadaver or deceased organ donation rather than relying on living donors in order to avoid the risk of commercial trading of organs and also to avoid the inherent risk to the health of the living donor, Anupriya Patel added. 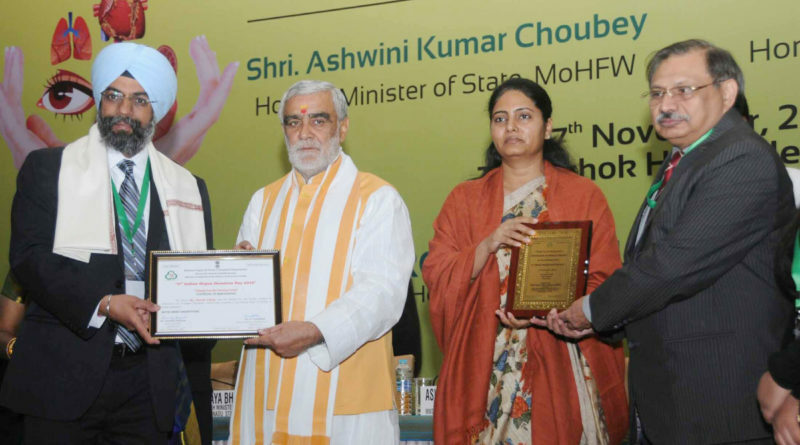 In pic: The Ministers of State for Health & Family Welfare Ashwini Kumar Choubey and Anupriya Patel felicitating the families of the organ donation, at the 9th Indian Organ Donation Day function, organised by the National Organ and Tissue Transplant Organization (NOTTO), in New Delhi on 27 November 2018.